Vasara has finally gotten a nice paddock friend; Elvera. I have been so nervous about letting anyone even try to put their horse in the same pasture, but after observing Elvera when she had Pogara as her company, I had to try. And it couldn't have gone smoother. It was all very undramatic and friendly, and Vasara lay down and rolled after only 5 minutes. I'm so happy and relieved that it worked out. Vasara has wanted a friend but it has been so hard due to her past very unpleasant experiences with sharing a paddock with another horse. When I left they were eating together from the same pile of hay. Yesterday's dressage training was amazing. 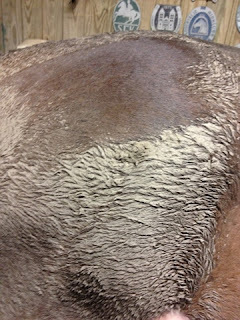 I rode without stirrups for 30 minutes and worked on gate changes to canter. omg I can really tell how far I've come in just a few weeks, and it's great and so rewarding to see all hard work pay off. Mathias is spending the evening at one of his best friends stud-party. The guy will think that it's over tonight when they take him home (late and drunk) but he is very much mistaken. After sleeping for a few hours they will drag him out of bed again, and they will all get on a plane to Poland and be back again on Sunday. Finally we have decided abut our vacations. I will take 4 weeks off between the 22nd of July until the 19th of August. We are talking about going down to Gotland together for a few days, since Mathias didn't get enought vacation for us to roadtrip through Europe and spend some time in Italy which was our original plan. Thats gives me 2 week vacation time left, which will be spent on the trip to Iceland and during Christmas. We drove from Copenhagen to Odense. The gang. Me and 13 boys ^^ We had an amazing 5 course dinner and loooots of wine. The evening ended with a game of pool and whiskey. The Jam festival is ongoing, great thing which was so popular!There are stages popping up all over town and band are playing all day and all night for a week. Working at Hesehus and meeting our team there, which was the whole purpose of our trip. Our programming team and me and Ole from Commercial IT. Åsa is really pushing us. "This is really hard stuff you're doing now, I'm raising the bar each lesson" she saig, and dear god did we feel it. I love riding for Åsa, she's amazing. And wow, Vasara, I can't believe how wonderful, loyal and ambitious you are. "She likes the way you ride, otherwise she would never have moved this great" Åsa told me. My dear sweet beloved colleague and friend Emilia from Finland spent the day at the office today, we had a full-day meeting. 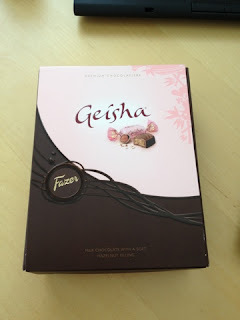 She had brought me a box of geisha, knowing that it's my favorite candy. Thanks hun!!!! Today me and Vasara started of with 30 minutes of dressage before jumping a bit. The dressage went awesome, abd jumping was so much fun and we did quite well. My plan is to jump a few obstacles every day I'm riding in the paddock, to make it a bit less over loaded fun as it is the best thing Vasara knows. So today we jumped a mini course consisting of three obstacles, and jumped an 80 cm oxer round and round. I can't jump higher in my dressage saddle, but Vasara can and jumped about 1 m instead just to show how silly and low she thought it was. 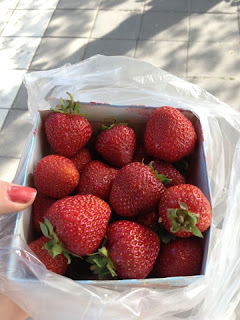 I bought 1 liter of Swedish strawberries and ate them in less than 10 minutes. Yummie yummie in my tummie! Me and Vasara were out on an advemnture today, riding in the wood. We were exploring some paths and it didn't turn out too well. What begun as a nice path soon became a terrible, hazardous nightmare, but we pushed through; me thinking that it would be a limited nightmare. But it wasn't... And we ended up not able to go back due to the horrible path we'd just survived, having to push on forward through just as bad surroundings, where one bad step would mean broken legs. We had no coice but to follow the "path" and hope to god that it would end some time. After 30 minutes we saw the light between the trees. A real road! with cars! we were saved. Or so we though.... Turned out we couldnt reach the road in any way (only cow bridges and other weird stuff) so we had to follow a new path back into the forrest again. And so it continued for another 20 minutes before we miracolously ended up back on the road we wanted to reach. Was spent at my mom's summer house at Värmdö. We had such a great time and I could really relax in a way I haven't been able to in a very long time. Change of scernery can really work magic. Thursday was quite a hectic day. 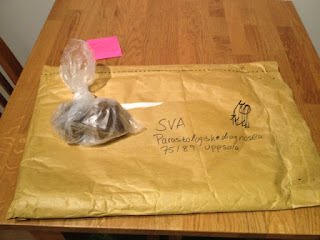 07:00 alarm rings 07:30 I leave home and get on the subway, carrying Vasaras poop sample. 08:00 I arrive at the physical therapy center, still carrying the poop, and meet Ann. 08:30 I leave the therapy center, and head for the subway again. 08:45-09:15 I travel to Slussen, meanwhile entering 8 differen places trying to post the poop package. 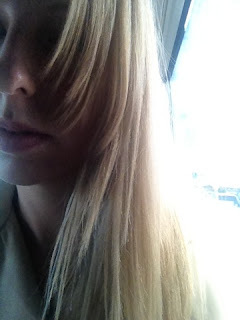 09:30 I arrive at svartensgatan 7 and sit down in Liza, my hairdressers, chair. The poop package is still with me. 12:00 I'm finished at the hairdresser, pays 2000 SEK for the service and heads to the subway again. 12:20 I arrive at Östermalmstorg and go to the Tomas Sabo shop and exchange the two charms mom got me in Innsbruck, since I already had both. I still carry the poop package. 12:40 - 13:00 I travel to work. 13:00 me and the poop package arrives at the office. 15:00 the post center in the same building opens. I post the poop package. Next Wednesday me and Tomas leave for Odense.We will have a nice time on the town with our developers when we get there, before getting down to business the next day. I'm really looking forward to meeting the guys, I have had daily contact with then for 9 months now and have never met them in person, only in a few video conferences. I've been such a good girl today; I got my first vaccination shot against the various diseases carried by tics. I've been putting this up, because I'm scared of needles and I've been sick, but today I finally made it! Now I have two shots left, the next one in 4 weeks, then it will be a few years until I need a refill I think. Tomorrow we have the day of since it's midsummer.Me and Mathias were supposed to spend two days sailing with Ida and Kristoffer, but we decided not to since the boat isn't completely ready yet and we don't want to stress that; it's supposed to be fun, not a must with a time limit. Being a bit late with the sending of the poop package really payed off. I got the results at noon today, after having posted the package yesterday afternoon. Awesome! Vasara basically didn't have any worms, but I'm gonna call the vet to hear what she says anyway. Since a few years it is not possible to buy any products agains worms for horses. You can only get hold of it if a vet grants it to you. This is so great, it stops those people who uses this stuff without having to and thereby creating resistant worms. Sending in Vasaras poop to get it analyzed for parasites and worms. We've been good students and practiced on our dressage home work both Saturday and Sunday. I hope this will show on tonight's lesson.I did find myself struggling a bit with catching the outer side, since my visit to Norway forced me into three days of not riding right after the last lesson. Yesterday I also did some balancing exercises, like cantering standing up with both hands in the air. Tomorrow will be spent in the forest for sure, we need that after three days of hard work. I was supposed to meet Niklas on Saturday and Elin on Sunday, but I've been suffering badly from anxiety this past week and hence ended up canceling all plans and spending the hours that I wasn't in the stable on the couch. I miss my friends but I'm always to tired or sick or mentally ill to see them when I plan to. It's even more difficult as people are growing up and getting jobs as there simply isn't any time left once you've gone to work and finished your errands. Yesterday me and Vasara were accompanied by Gabriella and Pogara and we rode on the fields. It was really nice to get to know Gabriella a bit more, she is really nice. It was Pogaras first time being ridden outside of the paddock, but with sweet Vasara in front it went really well. When we got back to the stable we decided to ride a while in the paddock also, but no sooner had we opened the gate before the storm clouds rolled in and the sky opened up, with flashes of lightning and thunder that made the ground shake. So we fled inside again. Unfortunately the image doesn't make the sky justice, used to cell camera. This morning it was my turn to take the horse out to the pasture, so I arrived to the stable around 8. I took everyone outside and then me and Vasara headed down to the paddock to train some dressage. It went very well, gosh she is an amazing horse, and after two days out on the field it was great to really work today. When I got home I fell asleep on the couch and now, 3 hours later, I'm awake again. I was supposed to meet Niklas today but... Sleep had to be prioritized. Mathias is in the car, driving down to Gothenburg together with Kristoffer to pack the loose boat stuff and to make sure that it starts it's journey back home okay. The company doing the move will drop the boat of in Liljeholmen tonight, and the boys will sail it back to our boat club. I got no sleep last night. To start with I can home from the stable around 10.30 and had to unpack and shower etc. I got to bed at 11.30 and fell asleep ok, but 12.00 I was woken up by Mathias and kristoffer who came home from preparing for the boats arrival today, aiming to get 4 hours sleep before they had to leave at 4 in the morning. So I woke up again when Mathias got into bed. Then at 4 when they got up. Then my alarm rang at 7. And between these things I woke up randomly. All this after 4 days of travel and hard work in Norway. So oh dear god I'm tired. Finally I got to see my baby again yesterday. She seemed happy to see me too and we hugged each other a bit before we got down to our routine. I was very relieved to see that the muck out quality had increased a lot since my last trip, and it wasn't a 60 minute job returning the stall to its normal state. This time it only took 5-10 minutes more than usual which was great! 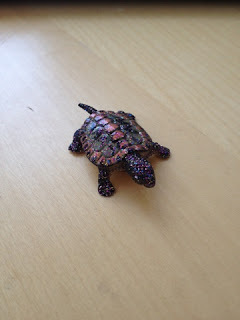 My darling had prepared a surprise for me; she had changed color while rolling around in the pasture in the rain. She looked extremely happy (with a flower attached to the mud on her face) and seemed to be saying "look mom!! 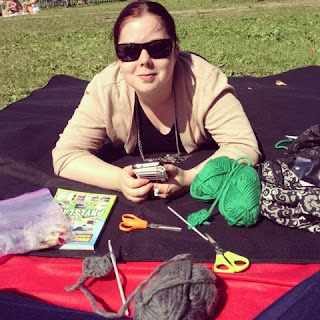 I had the best time outside today!" We then headed out and rode for an hour out on the fields, gosh that's nice! A color sample cleaned out. I'm back in Stockholm! Currently on arlanda express, on my way to the office. Today I'll get to kiss both Vasara and Mathias, happy! 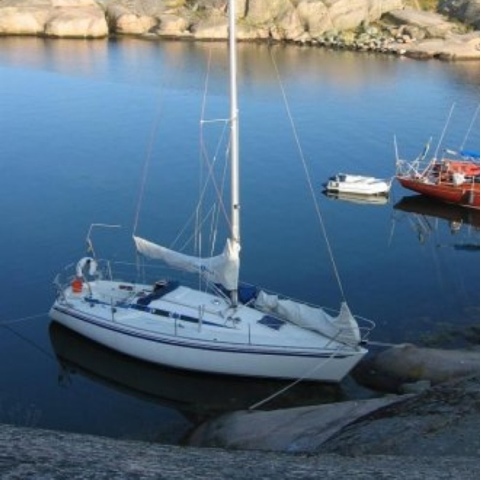 Our new sail boat will be coming home on Friday, it's so exciting! So this weekend will be spent at the harbou, fixing stuff, and hopefully some nice boat-barbecued food. I've conducted the KWS training in Oslo and I'm now ready to go home tomorrow. things have gone very well, but I haven't gotten rid of my cold as I had hoped. I miss Mathias and Vasara so much it hurts. Don't miss the first episode on the fourth season of pretty little liars! All water on Ekerö (the island where Vasara is) is contaminated by some kind of germ, making both animals and humans ill. The government has gone out with a warning, telling everyone to at least boil the water before drinking it. 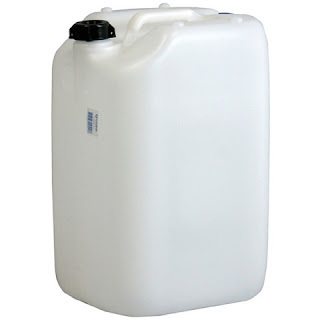 Myself and most of the people in the stable are brining water from home. Tomorrow I'm leaving for Oslo. I will be back on Thursday morning, and hopfully this will be the last education I hold for a few months. I will miss both my sweethearts so much! 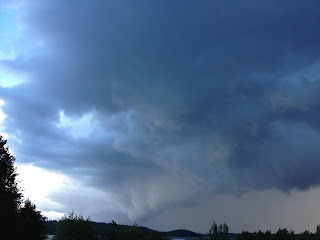 Today I had to ride in the craziest thunderstorm Sweden has seen for years. And there we were, training our dressage while the lightning and thunder were raising havoc. And sweet amazing Vasara didn't care what so ever, even when the thunder was so loud that we couldn't hear anything else, or when the rain were hitting us like spikes due to the sideways winds. So; this is the result from my crazy-expensive HD camera.... are you kidding me?! We're protesting, taking this back with loud voices and buying a GoPro instead. Last week I could finally move in to the indoor tack room. This is really great, I have my stuff 3 meters from the stall, it's so much warmer in the winter, it's so much clearner.... I'm happy. The only bad thing is that the locker is tiiiiny. 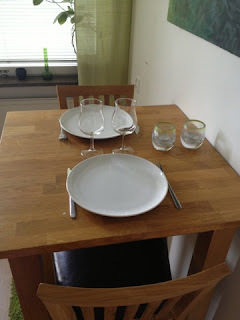 On Thursday me and Mathias decided to finally throw out all of our old china and cuttlery and buy new one. We've been looking everywhere after something we like, but haven't really found anything, so we had to shop at IKEA, buying the same one as we already had but this time in white. Boring.... I hadn't planned to shop at IKEA when I was 25.... On our way to the car the bag broke and.. well... the neighbours had something to look at. I have been terrible at updating the blog, things have been so hectic and I honestly don't know where the time went.I will try to do better and get back in the normal track again. 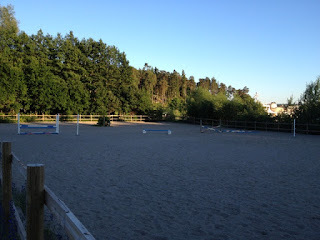 At 7.30 AM on Thursday, Swedens national day and hence a public holiday, me and Vasara were already down in the paddock an ready for our dressage training. I can't even believe how awesome it all went. 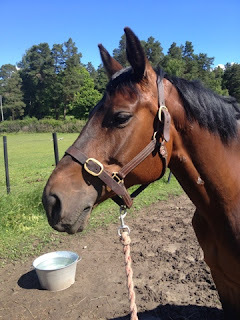 Both me and Åsa were euphoric and as always amazed over what an amazing horse Vasara is. Åsa filmed a lot with her phone but accidentally stopped the recording after a few seconds on all but one, such a shame! I will upload it as soon as I get it, it was too long to email over. We have set a goal: this fall season we will attend our first dressage competition. We've bought a new sail boat! Mathias drove down to Gothenburg on Saturday and signed the contracts. Now we just need to get it home somehow.... We will probably use the services of a special company which can actually transport the boat by a special truck. I gave Vasara a good washing today, as she had several days of rolling-dirt rooted deep in her coat. I use the ecological shampoo from Tobbe Larsson, but I think I might try something else next time I have to buy new shampoo. I'm just not happy with how much dirt it actually removes. I've been at home all weekend, just lying on the couch, coughing and feverish. Thank god Helene helped me both Saturday and Sunday which allowed me to get a lot better during these two days. I worked from home today so that I can be well enough to ride tomorrow. 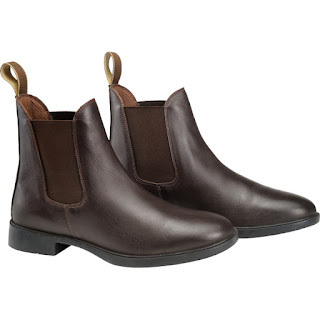 Finally my little princess has gotten her shiny new shoes.